Independent portion of a stone farmhouse dating back to the 15th century. This property, which has been, completely restored in 2012, offers 2 independent units separated by fences and hedgerows. Outside guests can enjoy use of a large furnished garden ideal for al-fresco dining and of a nice private pool. 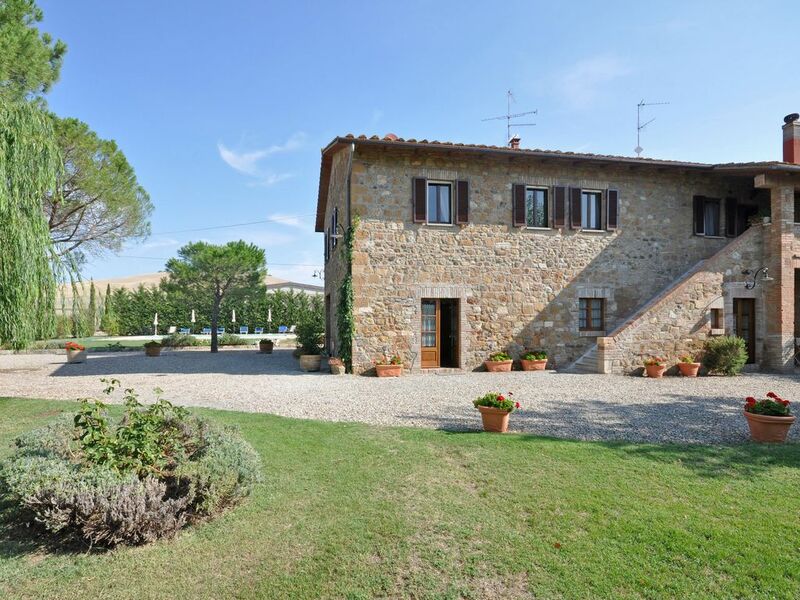 This property is situated in the splendid Val d’Orcia region, in easy access to the charming towns of Pienza, San Quirico d’Orcia, San Casciano dei Bagni. The access to the property is via an unpaved but well-maintained road suitable to any cars. Distances: San Quirico with general stores 8 km away, Bagno Vignoni 4 km, Pienza 10 km away, Montepulciano 16 km, Siena 50 km away, Cortona 52 km, Arezzo 70 km, Florence (airport) 135 km, Rome (airport) 190 km. At guests’ disposal: large furnished garden with table, chairs barbecue and swing, private swimming-pool (12 x 6 m – min. depth 1,1 m – max. depth 1,3 m – open from 01/05 to 30/09), open-air shower by the pool (only cold water). Extra Services: Baby bed (free of charge). Maid service by arrangement (€ 10,- / per hour to be paid on the spot). Three bikes available (free of charge). Chef service available by arrangement (€ 15,- / per hour to be paid on site). Pets are allowed by paying an extra charge of € 50,- / per pet (to be paid on the spot). 1st floor: dining-room, kitchen (oven, freezer, dishwasher, American coffee maker, toaster), living-room (satellite TV) with fireplace, 2 double bedrooms with ensuite bathroom with shower, double bedroom with ensuite bathroom with Jacuzzi shower. Ground floor: double bedroom (accessible only from the outside) with ensuite bathroom with shower (without window). Laundry with washing-machine and ironing facilities. Villa Cassia ist das schönste Ferienhaus, das wir in letzter Zeit gebucht haben. Es ist wunderschön gelegen und ganz tollausgestattet und eingerichtet. Es verbreitet eine schöne Stimmung und ist ein richtig schönes „zu Hause“. We can only thank you for the beautiful and inspiring accommodation. For 2 families (8 people) everything was well equipped. Great opportunity. The Orcia Valley is magnificent and Bagno Vignone unique. We will gladly come back to see more. We reccomend this villa and would come back soon.